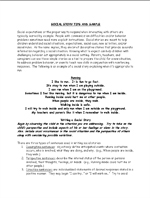 Brief tips and a sample social story for a hypothetical social situation. Descriptions and photos of various visual support techniques. This page includes links to both internal (CARD) and external (non-CARD) websites. External links are selected and reviewed when the page is published. However, the CARD is not responsible for the content of external websites. The CARD website does not accept submissions or requests. National professional, scientific, and credentialing association for audiologists, speech-language pathologists, speech, language, and hearing scientists, audiology and speech-language pathology support personnel, and students in those fields. Augmentative and alternative communication (AAC) devices. Promotes communication development in children who have language delays, autism spectrum disorders including Asperger’s Disorder, and language and literacy development. 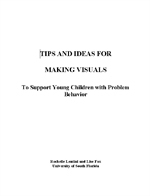 Introduction to using Visual Strategies to meet the communication needs of individuals who have an autism spectrum disorder, ADHD, or other communication and behavioral challenges. Autism Speaks has prepared a list of visual tools and aids to communication including their Visual Supports and Autism Spectrum Disorder Tool Kit.